Microsoft confronts Bose with noise-cancelling Surface headphones | What Hi-Fi? Google Assistant and Amazon Alexa voice assistants are already evolving from wireless smart speakers into other consumer electronics products - including headphones. Google’s is built into its Pixel Buds, the OnePlus Bullets, Sony’s WH-1000XM3 and Bose’s QuietComfort 35 II, to name a few. Alexa powers those Boses too. Microsoft’s Cortana was arguably once on the frontline of virtual assistant technology alongside its peers, but it quickly fell by the wayside as Assistant and Alexa became more and more established. But the tech giant is clearly determined to peddle Cortana forward while increasing its presence in the hardware market. 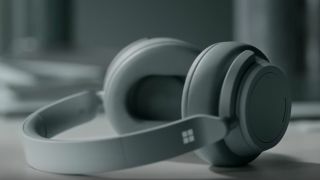 Enter the Cortana-powered, noise-cancelling Surface over-ears, the company’s first pair of premium headphones. Built-in Cortana means users can control music playback, set reminders and alarms, and get answers to questions - all hands-free. Earcup controls and a touch interface provide a tactile alternative, and head detection automatically pauses music or mutes calls when you remove them. Surface marries that voice functionality with thirteen different noise-cancelling levels, letting the user choose how much noise they want to let in. Naturally there’s angling towards Microsoft PC users, too, with Swift Pair enabling direct connection between a pair of Surfaces and a Windows 10 PC. The Surfaces claim a 15-hour battery life with Bluetooth, noise cancellation and Cortana on, or 50 hours in idle mode. Two hours plugged in can restore a juiceless battery to a full charge, while fast charging can provide an hour of playback in just five minutes. Indeed, Microsoft has some way to go to truly compete with the ubiquity of Assistant and Alexa, but the immediate obstacle to its $350 Surfaces is Bose’s class-leading QuietComfort 35 II.